Late fall is officially here in the Lehigh Valley (my flannel is out in full form) and that's the signal to move the outdoor wine and beer drinking inside, or at least to your closest fire pit. And what better to throw in your glass as you warm up than a pour of some local booze? The Valley has a number to choose from, but we're throwing a spotlight on our friends at Triple Sun Spirits. Paired with the mind and passion of former brewer Kristofer Kwant, the spirits at Triple Sun are created in-house with an authentic small-batch style, giving them character and utilizing an environmentally friendly process. Kwant's got his sights set on providing the Valley with not only top-notch artisanal spirits, but also a community business that involves other local makers in its process. So far, Triple Sun has partnered with Hardball Cider and Weyerbacher, with more to come in the future. Their location is also a hotspot in Emmaus, situated right next to Yergey Brewing Company, and host to delicious local food trucks and events of all kinds (including one of our favorites: Yoga Happy Hour). You can currently grab their Caribbean-style rum (light, dark, and golden), gin, apple brandy, corn whiskey, and stouted whiskey directly at the distillery, by ordering online, checking out some of the local establishments that serve Triple Sun spirits (House & Barn and Hardball Cider on Main are just a few), or browsing your local Wine & Spirits. The distillery also has a cocktail menu to rival some of the best bars in the area and it changes with the seasons. One of our favorites is apple brandy hot cider and since bourbon is on the schedule to be released in September 2018, we'll be back to try an Old Fashioned or ask for it neat and enjoy all the unadulterated flavors. For more info, to plan a visit, or to see what events are coming up, visit Triple Sun's site and follow them on social media (Instagram, Facebook). If you make a visit and love everything you drink and see, consider picking up some holiday gifts to share the Triple Sun love with friends and family. 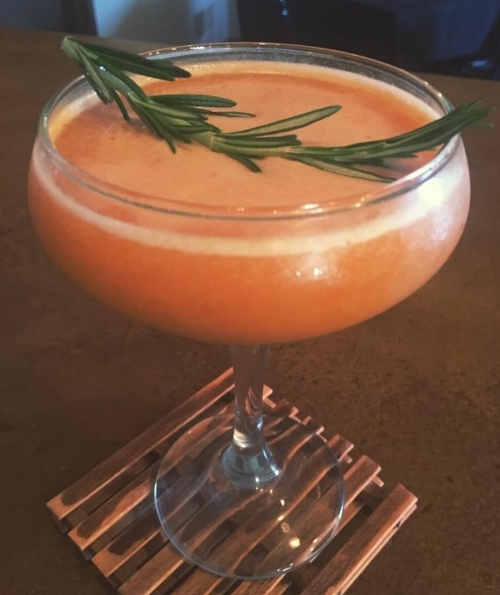 The genius mixologists at this Emmaus distillery are jumping on the fall bandwagon and providing us with a recipe for their Pumpkin Spice Gin Sour. The name and directions are as basic as they come—not to mention delicious! Pick up a bottle of their gin and try it out. Put first 5 ingredients in ice and shake for 1 minute; pour through strainer into coup glass. Then, garnish with pumpkin spices (cinnamon, nutmeg, ginger and clove) and a sprig of rosemary.